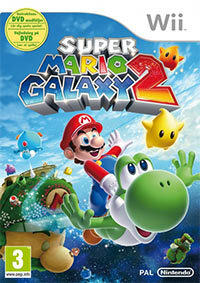 Super Mario Galaxy 2 is a sequel to the 3D platformer released in 2007. The title plumber and his faithful friend, Yoshi's green dinosaur, once again embark on an adventurous, cosmic journey, visiting many bizarre planets and performing various tasks. In 2007, Super Mario Galaxy took the world of video games by storm. Now this first true Mario sequel in years re-energizes the franchise with new levels and new power-ups. Plus this time Mario gets to team up with his dinosaur buddy Yoshi, who adds new possibilities to the gravity-defying game play. It’s everything you love about the first game and more. Game score 9.1 / 10 calculated out of 502 players' votes.